8th to 16th July at the Event Hall, 1st floor of Amarin Plaza. 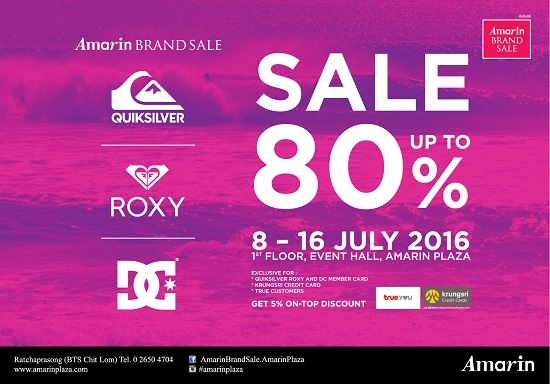 Bangkok – Amarin Brand Sale by Amarin Plaza invites all lovers of a sporty challenge and a dynamic lifestyle to come by and update their trendy sports fashion apparel. 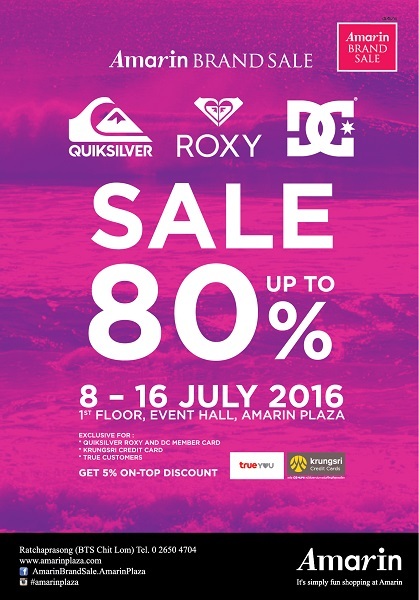 All sports items, water sports accessories, beach-wear and street-wear as well as swimwear, shoes and a full series of accessories from Australia are available from three world-class brands, Quiksilver, Roxy and DC with discounts of up to 80%, only at "Amarin Brand Sale: Quiksilver, Roxy & DC Sale up to 80%". Start 8 - 16 July at the Event Hall, 1st floor of Amarin Shopping Plaza. Even more!!! Choose to use either your Be Smart Member card for a 10% discount or use your Krung-Sri credit card, Quiksilver Roxy & DC member card or present your TRUE membership card to receive 5% off. Your card must be presented to the cashier.